Connectivity between computers could be as important as communication between people. 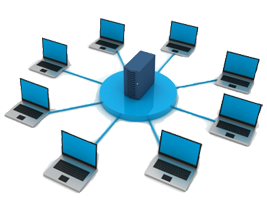 We can build you a new network, or troubleshoot and improve on your existing one, all at our usual low price. Have more than one computer? Let those digital streams join the greater ocean of the Internet! Dr PC Fix technicians can get two or more computers sharing your internet connection quickly and easily..
Networking is really a specialty of ours, please call if you have ever been dissatisfied with someone helping you on your network. And we can do all of this over the phone with you, or on site in some areas. We also offer many networking services for small business and offices. Give us a call for a quote! Networking is complicated if you don’t have the experience. Call Dr PC Fix at 425-214-5241 so our expertise can be put to work for you.